The AiO Lighted Wall Mirror combines thin-profile, minimalist design with flawless functionality and connectivity. 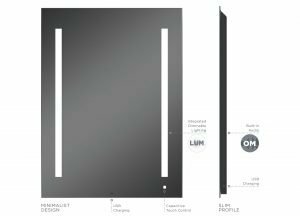 LUM™ Lighting technology offers on-mirror, one-touch dimming to tailor your lighting for any task. OM™ Audio lets you connect with Bluetooth® to the embedded speakers, while integrated USB ports make it easy to recharge your technology. The result: a sophisticated furnishing that simplifies your life. AiO Lighted Medicine Cabinets merge sleek design with state-of-the-art features to enhance your routine. 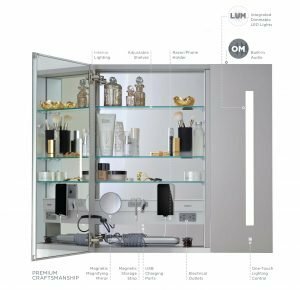 LUM™ Lighting technology with one-touch dimming creates the perfect level of illumination, and the built-in, Bluetooth®-enabled OM™ Audio transforms your medicine cabinet into a sound system. The moisture-resistant interior features adjustable shelves and additional lighting, along with two magnification mirrors for fine-tuning tasks. Razor holders and magnetic storage strips keep styling tools organized. This is the medicine cabinet with everything. 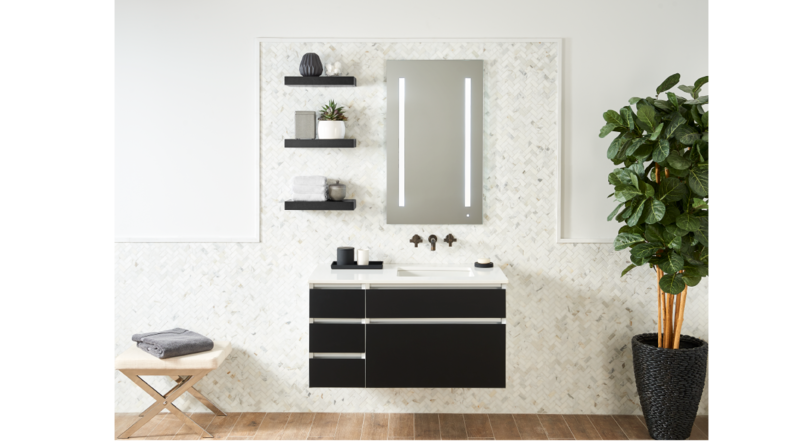 The medicine cabinet and the mirror is available in warm, relaxing tones (2700K) that replicate indoor light or the existing cool, invigorating tones (4000K) that simulate bright daylight. Robern recently integrated the warm LED lighting based on customer demand for lighted mirrors and cabinets that match the existing lighting in their styling spaces and bathrooms. Combining precise task lighting with a minimalist aesthetic, the AiO Lighted Mirror and Cabinet is an eye-catching design element that doubles as an energy-saving lighting fixture. Its thin profile conceals a wealth of technology, including a capacitive-touch dimming switch, built-in audio, and Bluetooth® connectivity. And with lighting built directly into the mirror, installation is simple and straightforward, for sophistication that’s built to last. 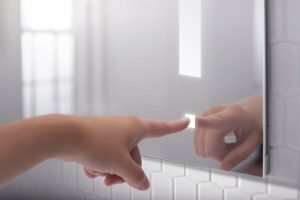 The AiO Mirrors and Cabinets offer a solution to match the lighting of the customer’s bathroom mirrors and cabinets to the rest of their bathroom lighting with an LED lighting option. Robern offers a range of renewable, recycled, and recyclable materials in each design to support our shared commitment to preserving the environment and strengthening our communities. Robern uses healthy building materials without harmful off gases. Aluminum and glass are two of the signature premium materials built to last. With updated features designed to meet your changing needs, the AiO Collection combines timeless style with cutting-edge technology. The mirror and medicine cabinet feature USB ports, which make multi-tasking a breeze. The cabinet features integrated electrical outlets and an optional Entice magnification mirror highlights the finer details of your daily prep. The magnetic storage strip, razor holder, accessory trays, and adjustable shelving easily accommodate your must-have essentials. Whether you’re getting ready for a morning meeting or a night on the town, the AiO Medicine Cabinet brings effortless ease to your routine. The new 70-inch AiO Wall Mirror brings the bright and beautiful look of LUM™ Lighting to a full length mirror that illuminates guests’ images from head to toe, while the new 40-inch AiO Medicine Cabinet adds 10 additional inches of task lighting and convenient high-tech features to enhance guests’ daily routine.